Today marked the start of Britain’s best gardening event, the Harrogate Spring Flower Show. For garden design inspiration and horticulturally related shopping there’s no better place to be – especially after the grey and wet Spring we’ve endured. The Show was bustling with enthusiastic gardeners eager to be inspired by fabulous floral colours and insights from gardening experts. 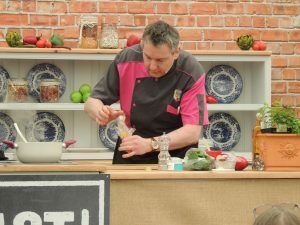 Yves was one of the top talented chefs from across the region selected to showcase all that is great about Yorkshire produce in the show’s FEAST! 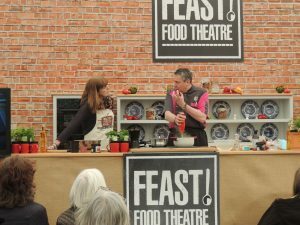 Food Theatre. 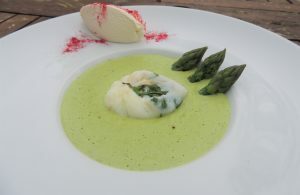 To a packed house and using fresh seasonal produce, he demonstrated how to make Asparagus Velouté, Poached Egg with Fresh Herbs and Smoked Chantilly. 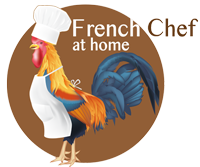 Yves took visitors through the recipe step by step and then invited the audience to join him to taste the dish. If you’d like to create the recipe yourself, follow this link for the recipe. The Harrogate Flower Shows are held in April and September and are organised by the North of England Horticultural Society. All profits are used by the charity to promote gardening and horticulture in the North of England. A lovely summery dish to make the most of the warmer Spring weather and the delicious local asparagus that is coming into season just now. Finely chop the asparagus and keep the heads 5 cm long. Chop the onion. In a saucepan, brown the onion and the asparagus with the butter. Add the white wine. Bring to the boil and cook for 5 minutes then add the cream and leave the velouté to simmer for 15 minutes with the lid on. Cook the asparagus heads for 1 minute in salted boiling water. Leave to cool down. Cut out a 40cm x 40cm piece of cling film and crack an egg on the middle. Add the herbs and tie the cling film with a knot. Repeat 3 times with the remaining eggs. Boil the eggs for 4 minutes. Leave to cool down. Whisk the double cream with the smoked liquid to make a Chantilly. Add salt and pepper. Mix the latter with the velouté and pour in bowls. Add the eggs and asparagus and add a spoonful of Chantilly.